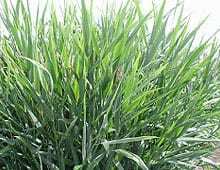 Forage: Reed canarygrass is primarily adapted for permanent hay or pasture on sites too wet for good performance of other forage plants. The forage should be grazed or mowed prior to heading as both quality and palatability decline rapidly after heading. A common mistake is to use reed canarygrass on wet sites where timely harvest is not possible. Make sure to use low alkaloid varieties for increased forage quality and palatability. Phalaris arundinacea L. reed canarygrass, is a vigorous, productive, long-lived, perennial, sod forming grass. It is a widespread species native to North America, Europe and Asia. The numerous broad, moderately harsh, erect leaves are dominantly basal. The coarse, erect stems may reach a height of 6 to 8 feet. Seed is borne in an open panicle which ripens from the top down and shatters readily as it matures. There are approximately 480,000 seeds/pound. The seed has a short storage life and should be checked for germination within 6 months of its use. Reed canarygrass has excellent frost tolerance and is well suited to wet soils that are poorly drained or are subject to flooding. It also has good drought tolerance.Growth begins in early spring and continues through thegrowing season. Regrowth following mowing or grazing is rapid on fertile sites. Forage quality is good prior to heading but then declines rapidly. Reed canarygrass is adapted to soils too wet for bromegrass, fescue and orchardgrass. It is very cold tolerant and will withstand temperatures well below 30°F. It is moderately drought tolerant but requires 18 inches annual precipitation or irrigation for good performance. It is adapted to a wide range of soil conditions but its major use is on poorly drained soils or those subject to inundation. Once established, it will withstand continuous inundation for 60 to 70 days. It does well on soils that range from moderately acidic to weakly saline-alkaline. It will tolerate saltier soils with frequent irrigation or natural flooding. A firm, moist, clean seedbed is needed for good emergence. The seed germinates readily but is somewhat slow to establish. Seed pure stands at a rate of 8 to 10 pounds/acre and 4 to 8 pounds/acre for mixtures. Seeding should be done in late fall or early spring. Plant shallow, no deeper than 1/2 inch. If necessary, irrigate to maintain surface moisture until plants are well established. New seedings should not be grazed until fully established. It is best to harvest for hay 1 to 2 times before grazing. To maintain plant vigor and promote rapid regrowth, leave a stubble of 3 to 4 inches after mowing or grazing. Start spring grazing after plants reach a height of 10 to 12 inches. Maintain grass height below 12 inches during rapid spring growth. Harvest hay when the first seedheads appear. Reed canarygrass will persist under close, frequent use, but yield will be greatly reduced. Its persistence under heavy use makes it well suited for calving, lambing, holding areas or other special-use pastures. To maintain good yields, an annual application of fertilizer will be required on most fields depending on soil test results.